The preeminent comedy of anima...effervescent and breezily paced, from the car-chase opening to the big finish capped with one of the all-time-great punchlines. 120 min. MGM Distribution Company. Director: Billy Wilder. Cast: Marilyn Monroe, Tony Curtis, Jack Lemmon, George Raft, Pat O Brien (II). 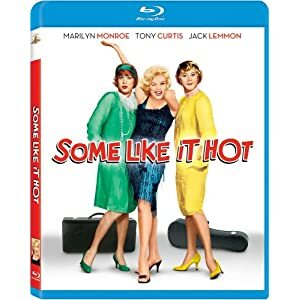 The deathless gender-bending comedy Some Like It Hot topped the AFI's 100 Years…100 Laughs list in 2000, and it's likewise considered by many a career-topper for director Billy Wilder and stars Jack Lemmon, Tony Curtis, and Marilyn Monroe. There's an illusion of effortlessness about Some Like It Hot that contributes to its longevity: though the characters are sweating through the madcap farce, Wilder, his co-writer I.A.L. Diamond, and the top-notch cast keep the proceedings effervescent and breezily paced, from the car-chase opening to the big finish capped with one of the all-time-great punchlines. Curtis and Lemmon are well teamed as Joe and Jerry, small-time musicians hustling a living in 1929 Chicago. Their gig at a speakeasy hidden in a funeral home dries up when the cops raid the joint, and matters go from bad to worse when the pair accidentally witness a gangland slaying that could well be the St. Valentine's Day Massacre. To escape with their lives, Joe and Jerry dress in drag as their female equivalents—sax player Josephine and bass fiddler Daphne—the better to join up with the all-girl band Sweet Sue and Her Society Syncopators, bound for faraway Florida. The secret co-ed situation tests the men's self-control, especially when they meet featured vocalist and ukelele player "Sugar" Kane Kowalczyk (Marilyn Monroe, at maximum va va va voom). As if keeping up appearances weren't hard enough, Joe takes on the secondary secret identity of millionaire "Junior," sleazily designed by Joe to fulfill Sugar's every fantasy of a man (compounding the joke is Curtis' vocal choice of doing a hilarious Cary Grant impression). And then the mobsters—including George Raft's "Spats" Colombo and Nehemiah Persoff's "Little Bonaparte"—show up, en masse. Monroe gives her archetypal comic performance as a sweet but dim bombshell (when it comes to men, she sighs, "I always get the fuzzy end of the lollipop"); she also performs four songs ("I'm Through With Love," "I Wanna Be Loved By You," "Runnin' Wild, " and the title tune). It's easy to see why Joe and Jerry want themselves some Sugar, but she's such an endearing innocent—in emotional terms, anyway—that she winds up turning the practiced cad Joe into a stand-up guy. Of course, masculinity and femininity are the subversive stuff of the film. Joe improvises a very funny tall tale of paralyzing sexual trauma as he pretends not to be turned on by Sugar, but the macro joke deals with the actor becoming the role. Joe tells Jerry, "Now you know how the other half lives," and he's right: Jerry's reluctance to spend the night distracting genuine millionaire Osgood Fielding III (Joe E. Brown) turns to girlish glee the morning after. In what could be the film's most memorable scene, Lemmon dances about his hotel room, shaking maracas and enthusing about how his smitten suitor proposed marriage. When Joe shakes him out of it, Jerry tells himself, "I'm a boy. Boy, oh boy, am I a boy." Some Like It Hot is the preeminent comedy of anima. MGM dolls up Some Like It Hot real nice in its Blu-ray debut. Basically replicating the 2-disc Collector's Edition DVD—except with hi-def A/V specs—this disc features an impressively natural image that looks like the film we all remember while offering more detail than it has ever shown on home video. The black-level is excellent, and contrast looks just right, allowing for unfettered enjoyment of the picture and its suddenly enhanced textures. Though film buffs will skawk at the exclusion of the original monaural audio, the DTS-HD Master Audio 5.1 surround mix on hand here is subtly constructed and basically unimpeachable in winningly filling out the music and gently separating the effects for a bit of immersion while keeping most of the sound to the front. First up among the extras is a collage-style audio commentary featuring an interview with Tony Curtis, archived interview with Jack Lemmon and commentary by Paul Diamond (son of I.A.L. Diamond) and screenwriters Lowell Ganz & Babaloo Mandel. The latter two are just fans of the film, but this makes for a fairly interesting track all the same, and it certainly boasts some variety in its list of commentators. The retrospective featurette "The Making of Some Like It Hot" (25:45, SD) includes interviews with Billy Wilder, I.A.L. Diamond, Jack Lemmon, Tony Curtis, production company head Walter Mirisch, and I.A.L. Diamond's widow Barbara Diamond. 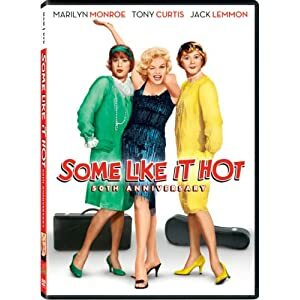 "The Legacy of Some Like It Hot" (20:22, SD) adds to the above participants Hugh Hefner, UCLA cinema professor Harold Suber, and director Curtis Hanson, along with footage from a a 1984 San Diego screening of the film. "Nostalgic Look Back" (31:13, SD) finds Tony Curtis interviewed by Leonard Maltin. "Memories from the Sweet Sues" (12:03, SD) gathers one-time "Society Syncopaters" Marian Collier, Laurie Mitchell, Sandra Warner, and Joan Nicholas to wax nostalgic. Lastly, we get the "Virtual Hall of Memories" (21:04, SD), a montage of stills and film clips, and the film's "Theatrical Trailer" (2:20, HD). All site content © 2000-2019 Peter Canavese. Page generated at 04/17/2019 10:55:01PM.